Location: Adjacent to the Wide World of Sports Complex, near Caribbean Beach Resort, across from Pop Century Resort, and not far from Hollywood Studios. Address: 1850 Animation Way, Lake Buena Vista, FL 32830. Phone: (407) 938-4000 Fax: (407) 938-4040. Parking fee: $13 per night. Check-in: 3 PM. Check-out: 11 AM. Resort Type: Value. This is the newest, and arguably the jewel in the crown of Disney value resorts. Open for business in 2012, it’s one of the two Disney resorts that have family suites in addition to some regular rooms. 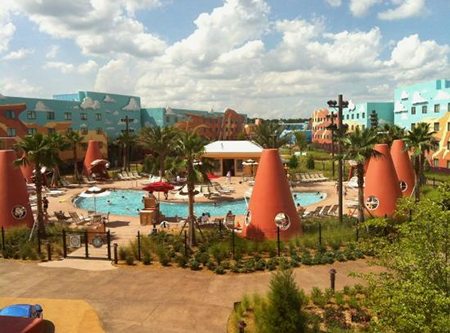 The other resort with family suites is Disney’s All-Star Music Resort. Each “theme” is made larger than life amidst its own cluster of buildings surrounding a courtyard in true value resort style. There are 1,984 rooms in all, with 1,120 family suites that take up to 6 guests and 864 standard rooms that take up to 4 guests. 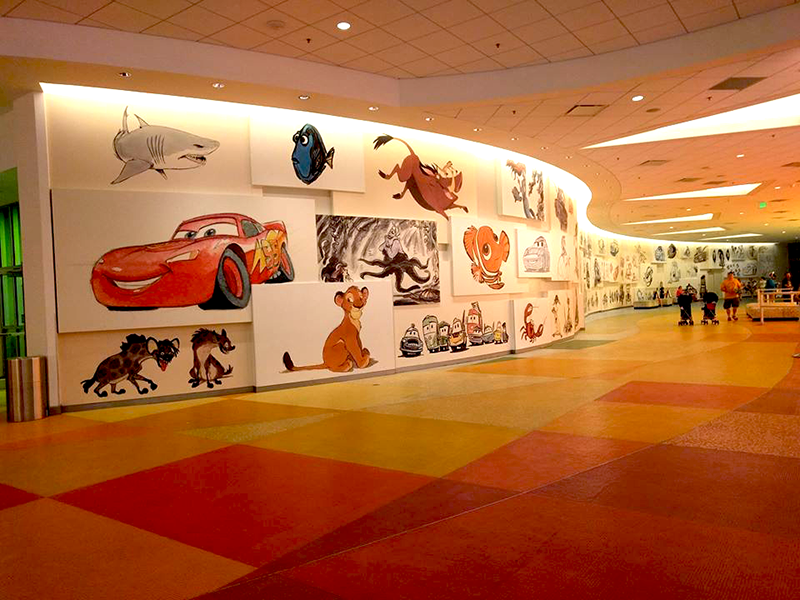 The Art of Animation is one of Disney’s four Dog Friendly resorts. While service animals are permitted in every Disney World resort, only these four resorts allow dogs that are not service animals. The resort hugs the shore of Hourglass Lake. The waist of the hourglass is a walking bridge that takes you to the Pop Century resort on the other side. This allows for some great views, and a nice walk to Pop Century where you can eat at their food court and enjoy the atmosphere. There’s a scenic, paved running/walking trail that winds all around it. As is true of all the Disney lakes, it is not swimmable. 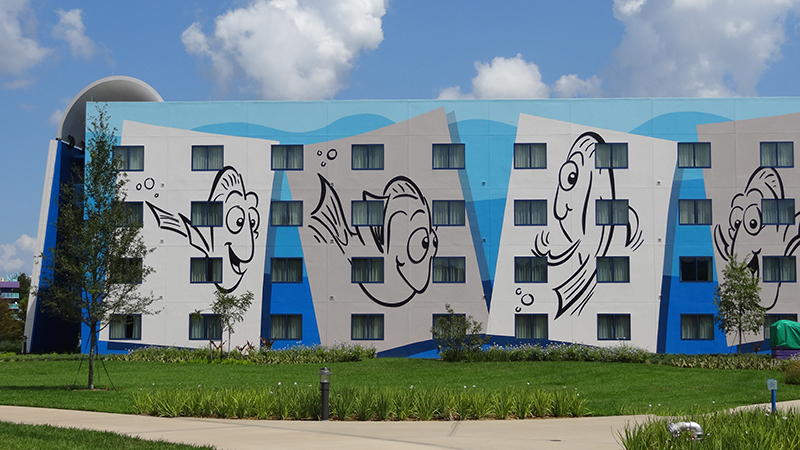 Art of Animation is a Disney Value resort, which makes it one of Disney’s more affordable options, especially if you’re choosing a small non-suite room. 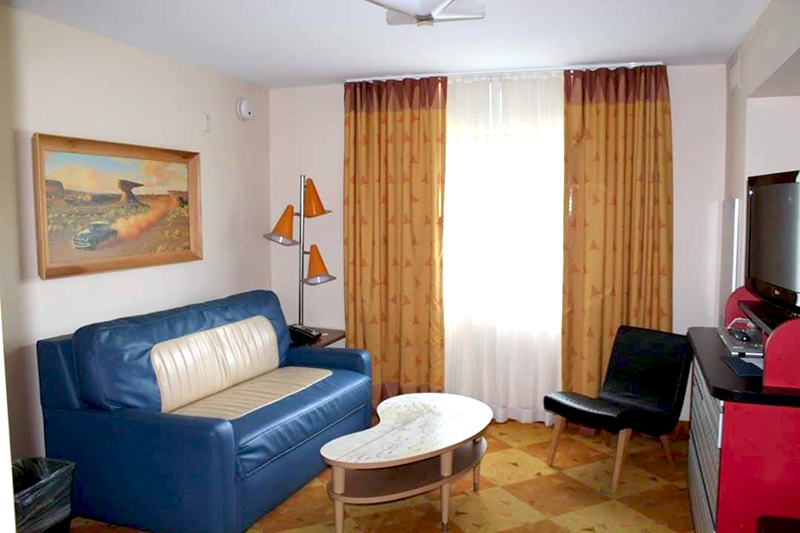 Naturally value resorts don’t have the level of amenities and luxury you’ll find in the moderate and deluxe resorts. Regardless, when you add in the perks like free parking in the four parks, free transportation, Extra Magic Hours and more, they can make staying right on property a good value. If you’re choosing one of the Family Suites at this resort, the extra space can make the additional price a great value. Another thing to consider is that Disney resorts are known for being clean and well maintained. Sure, you’re giving up space in the standard rooms, and luxury in the rooms and suites, but you’ll also want to factor in that intangible Disney “magic”, which to hundreds of thousands of people is a game changer. 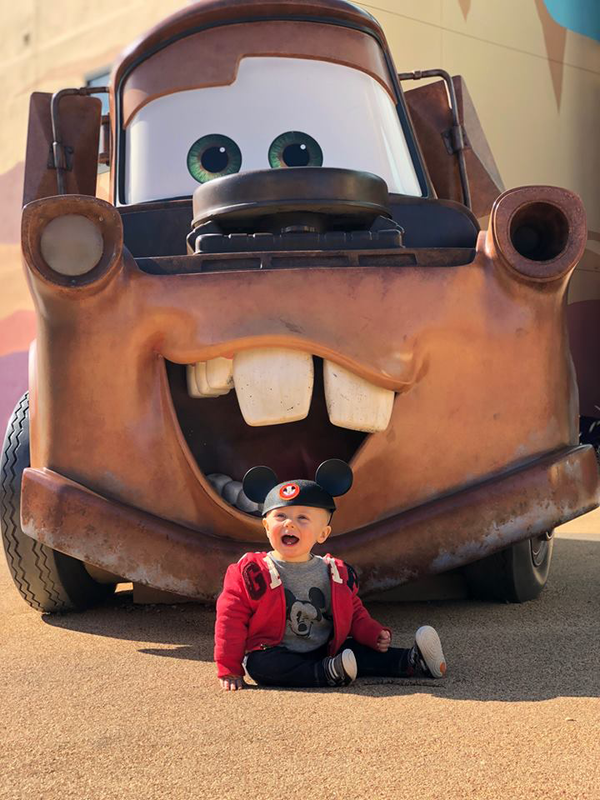 You’re getting a resort experience that has all the over the top Disney touches, great Disney customer service and everything you need to have fun. If you’re on the fence about staying on property and need help deciding, check out this article: Should I Stay in a Disney World Resort? If a Value resort isn’t your thing, and you have the budget for it, take a look at the Moderate and Deluxe resorts, or a Disney Vacation Club Villa. 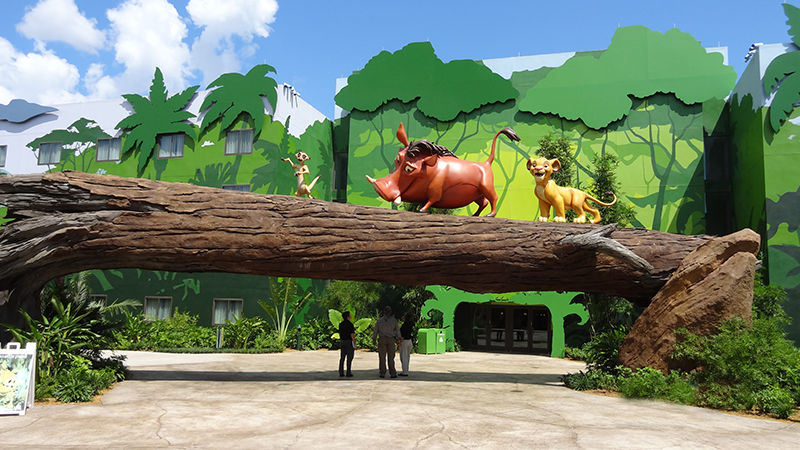 There are HUGE discounts available using Disney Vacation Club point rentals. You can get a Disney Deluxe Resort Villa at somewhere around half price, give or take. Check out our article called How to Save $$$ (Safely) on Disney Vacation Club Rentals. If you enjoy the Disney movies represented here, you’ll enjoy the life-sized and larger than life theme decorations. Most kids and even most adults who are Disney fans will enjoy it! The suites give you a lot of room, along with some adult privacy. This is absolutely Disney territory! Children and adults will enjoy the larger than life jaw-dropping icons, and the fact that there’s something fun to see everywhere you look. 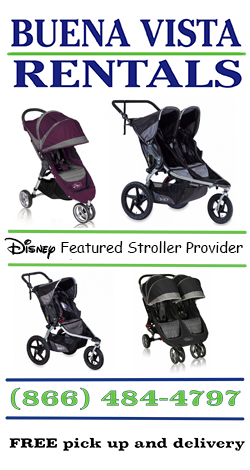 Low prices compared to the moderate and deluxe Disney resorts. Dedicated buses – This resort doesn’t share with other resorts which can mean shorter waits. 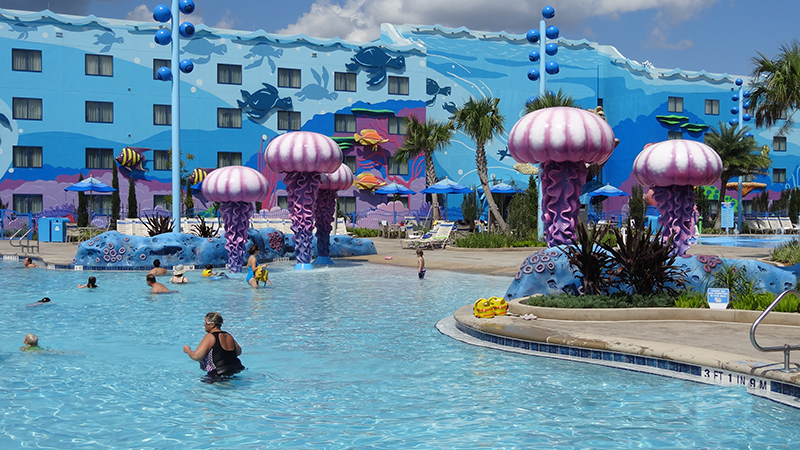 Its highly themed pools add another element of fun to your vacation. The food court is convenient, more affordable than full-service restaurants, and has a lot more options than most (and maybe even all) Disney resort food courts. You get all the benefits of being in a Disney resort, such as Extra Magic Hours, room package delivery, transportation, etc. You can walk to Pop Century. It’s fun to check out the resort, plus they have a great food court there, so that gives you another dining choice. Dogs are allowed here. This is an advantage for dog lovers, but see below for the other side of the story. A step up with the decor compared to other value resorts. We find that the decor, icons and atmosphere here seems more detailed than the other value resorts. The standard rooms are REALLY small. If you’re trying to get an ECV or wheelchair in a standard room, it’s extremely tight. It can be done, but it’s not as easy as in the resorts that have larger rooms. The resort is very spread out with longish walks for some guests. No hot tubs in the pool areas in this resort. Value resort level luggage service is not as convenient as in the moderate and deluxe resorts. It can be noisy here at times. Large groups of kids tend to stay here. Dogs are allowed here. This can be a disadvantage for those with allergies, fear of dogs, etc. Most expensive of the Disney value resorts. Yes, it’s imperfect, but it’s Disney. Many people would rather stay at a Disney value resort than a much more deluxe resort somewhere else. There’s that intangible “magic” that everyone talks about at the Disney resorts. It’s real and you can’t experience it anywhere else. If a value resort fits within your budget, and the theme of this resort appeals to you, this may be a good fit for you. 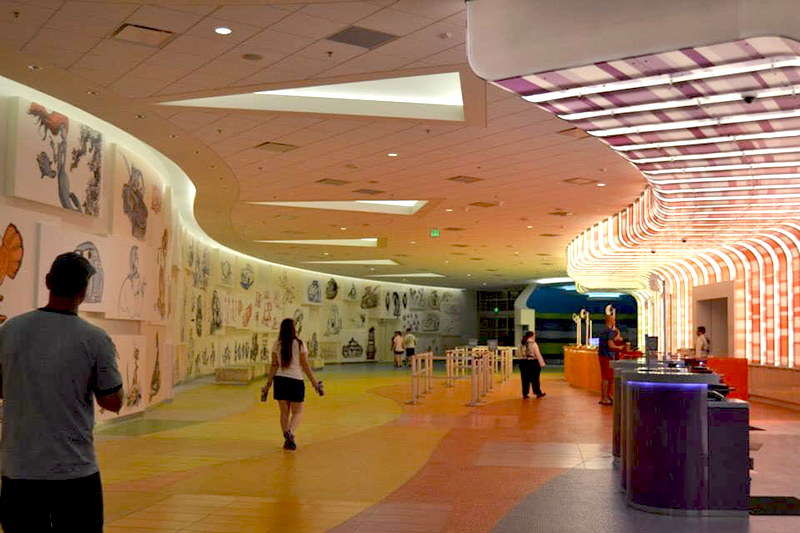 Animation Hall houses the check-in for the resort, the arcade, store, food court, and business center. Right outside the check-in entrance are child-sized easels with paper and markers, along with a cast member to help you draw the featured character of the day. Inside Animation Hall the decor details the process of animation from sketch to final cell. Running along the back wall are drawings taken from actual artist sketches. You can see some characters as they were originally conceived: Ursula from Little Mermaid, for example, was once intended to be skinny! A cast member explained that often the look changes to match the actor they hire to play the character. 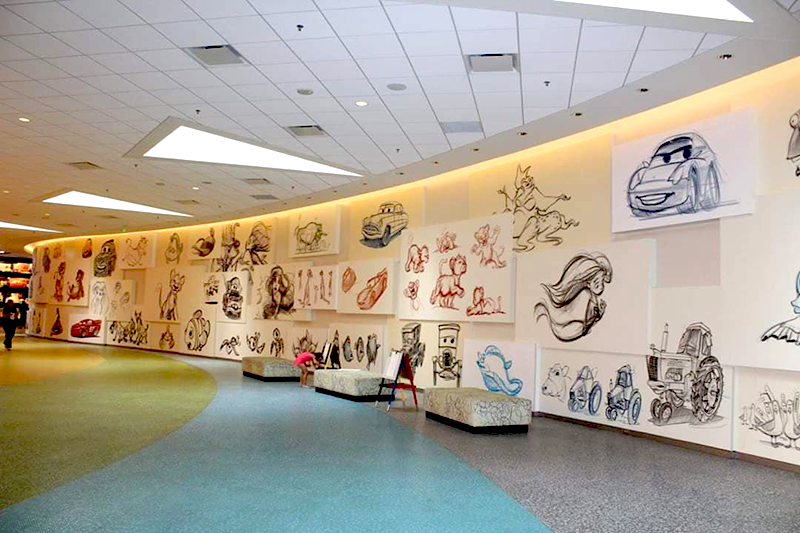 Along the wall, the drawings change from rough sketch to colored images. 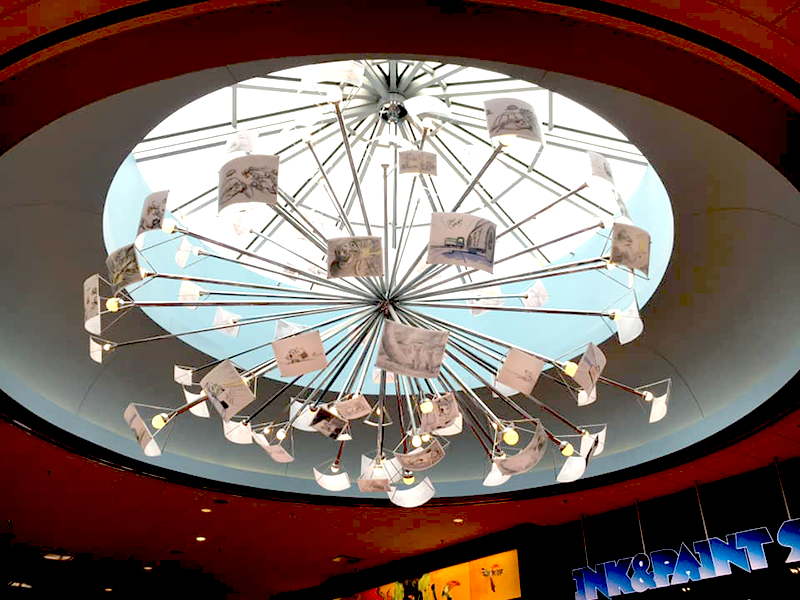 At the end of the check-in wing is the “storyboard chandelier” designed by Cars artist John Lassiter. The glass plates are examples of storyboards, and the chandelier is signed. Right by the chandelier is the entrance to the “Ink and Paint Shop”, selling mostly sundries such as T-shirts, hats, toys, candy, snacks, and things you would find in the drugstore. You have to walk through the store to get to the “Landscape of Flavors” food court, but luckily other than a subdued lollipop stand, the displays you pass are not screaming candy and toys to your children. So you might make it to dinner without a tantrum. Check-In: The check in area is a visual feast with a running rainbow of many colored curved counters in front of an equally bright striped rainbow backdrop. While we were there last, there was nobody in line, and there were plenty of bored-looking cast members waiting to help. During high crowd times all bets are off, but given the number of stations, the wait should be no worse than any other Disney value hotel. The kids and adult waiting areas: Right by check-in there’s a cozy carpeted area showing Disney movies to keep your kids occupied while you wait in line. Also in easy view of the check-in stations, to the far left are padded benches lining the back wall. Handicapped accessible info: There’s one counter in the middle that’s lower for wheelchair access. Fun Fact: In this resort, workers in reception aren’t called Cast Members like they are everywhere else in Disney World. They’re called Concept Artists. As mentioned above, the four sections that make up the resort (running from left to right as you face Animation Hall) are Little Mermaid, Lion King, Nemo, and Cars. The buildings are all four stories high. The suite buildings have interior hallways, stairs and elevators, and the standard room buildings have exterior hallways, stairs and elevators. The buildings themselves are unremarkable except for the massive murals on their exterior walls. They’re basically rectangular blocks punctuated by smallish, square windows. Exterior concrete staircases run up the ends of the buildings, and the rooms. 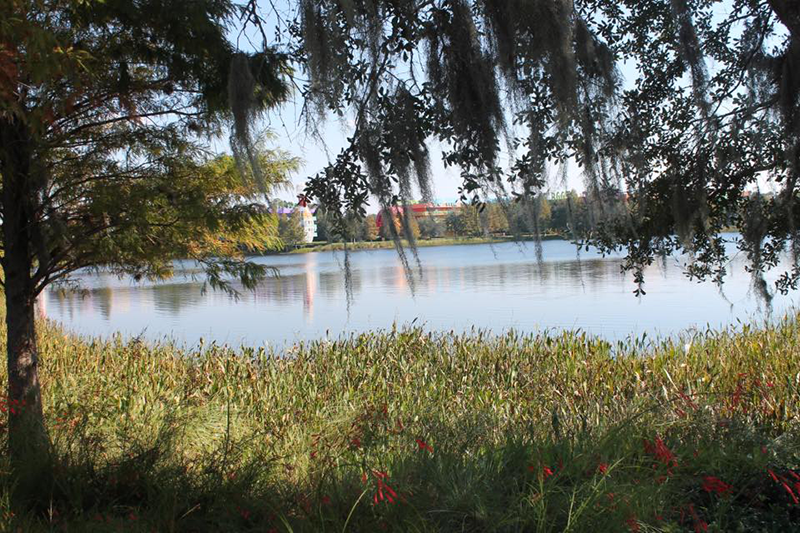 There’s none of the extensive detailing that characterizes the higher level Disney hotels. 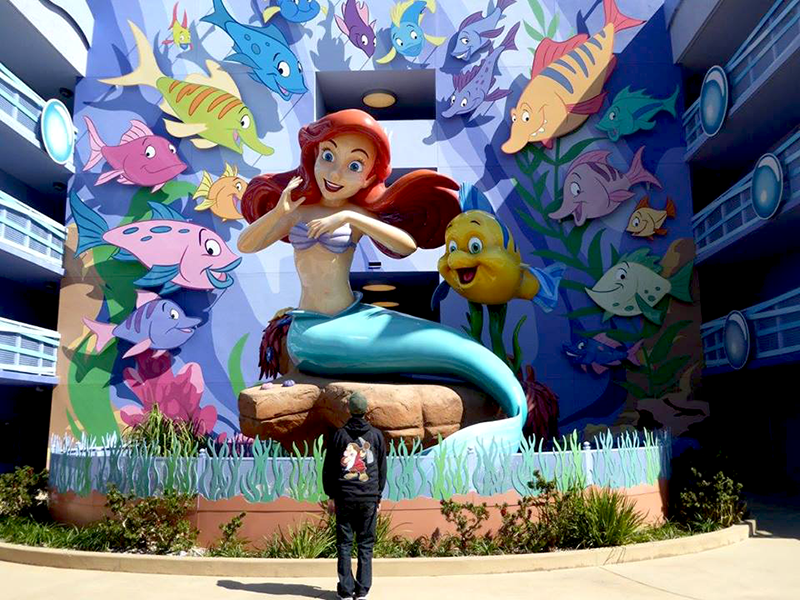 Yet what sets this resort apart from a run-of the-mill motel are the larger-than-life cartoon structures and backdrops decorating the exterior walls, and courtyards decorated to look like movie sets. The entire resort is a riot of child-friendly color, especially inside the rooms. It can also be a riot of noise, especially during high season. One look at the fun main pool (the largest pool in Disney World, not counting the water parks), and you’ll see the reason why. Another reason is the room layout: except for the Little Mermaid section, rooms are “family suites” which are just what they sound like. Our advice: if you were looking for a quiet, relaxing, spa-type experience, consider a Moderate or Deluxe resort. However if you’re looking for kid-paradise, this may be it. If you do choose a value resort, check out our article called Minimizing the Effect of Noise & Crowds in Disney World Value Resorts. Each themed building has its own courtyard. They’re incredible recreations of some of the characters and scenes from the corresponding movie. 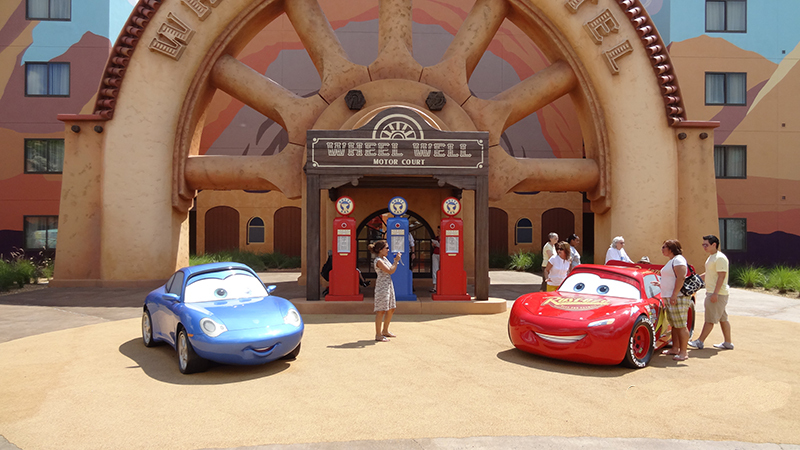 The “Cars” area has all of your favorite friends from the movie, real size. They sit outside each entrance along with various life-sized props. 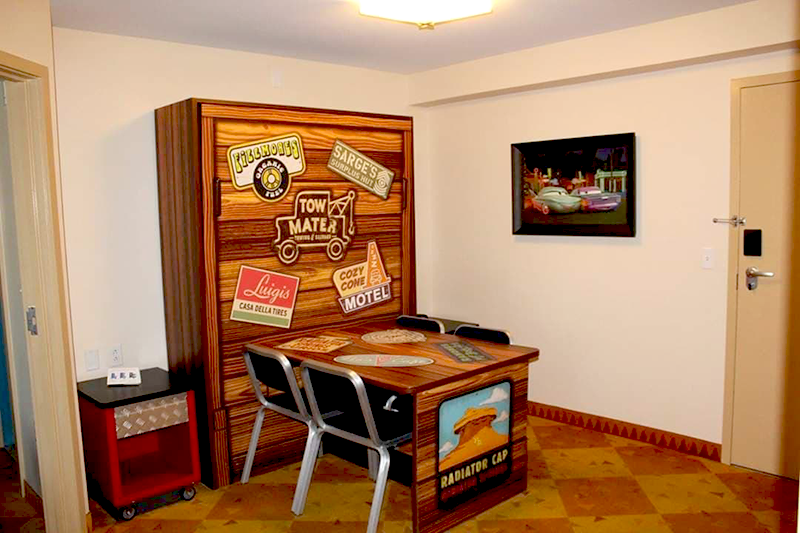 For example there’s a faux garage, faux-motel (The Cozy Cone, remember?). All around you, buildings are painted to look like a desert backdrop. In the Nemo section, larger-than-life statues surround the pool. The enormous turtle could be threatening, except he lolls on his back with a goofy smile and sleepy eyes. Nemo himself is small, but he peeks at you through the tentacles of a huge jellyfish, or maybe orange seaweed – we weren’t sure. There’s real living foliage which was selected to give the impression of underwater plants. 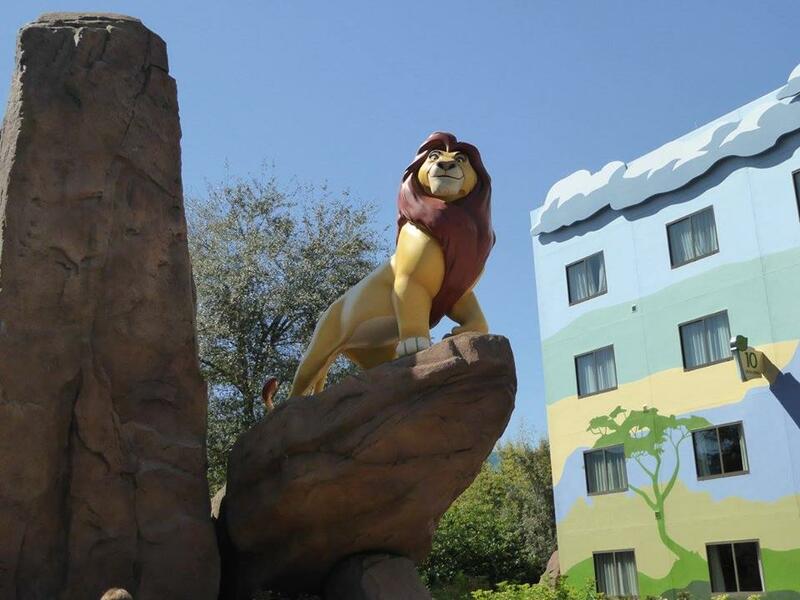 The Lion King courtyard also has larger-than-life statues of your favorite characters, and rock caves to play in. They’re guarded by a large, potentially scary elephant skeleton, Scar the villain lion, and a couple of hungry hyenas. 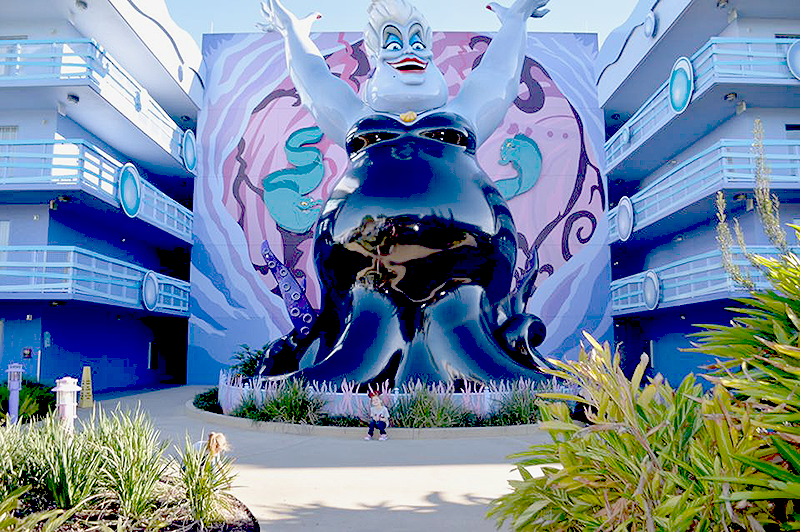 In the Little Mermaid section, towering over the guests are massive, colorful characters from the movie including Ursula, King Triton, and Ariel. The buildings are all four stories high, and except for Little Mermaid which has exterior hallways, all have wheelchair accessible doors that open when you push a button. They also have tile entrances and interiors, and carpeted hallways. The hallways are not huge, but adequate for a wheelchair or ECV. The decorations are all themed. For example, the East Australian current runs down the Nemo carpet, and the sconces in Cars resemble little traffic cones. Large, distinctive murals decorate the walls facing each elevator. The colors inside the rooms are multiple and bright, like the entire resort. Perhaps Lion King is the most subdued, with its savannah-browns and golds, and deep greens. Beds are firm. Pillows are foam and they do not have down available, although one cast member insisted that if you want them, they’ll find some for you even if that means running out and buying them. Depending on the area, extra chairs look cute, but they can be shaped awkwardly making them not the most comfortable for sitting. 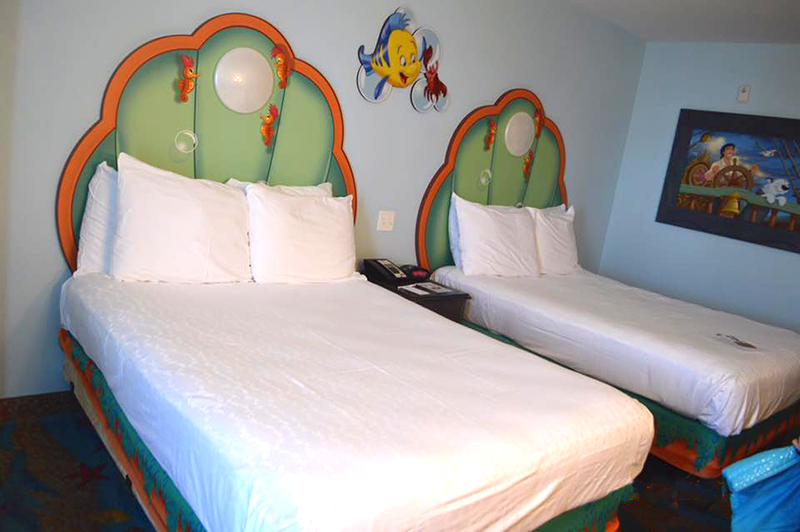 The non-suite standard rooms are only found in the Little Mermaid section, which consists of three buildings. The corridors are all outside. There are exterior stair cases at the corner or each rectangular building and one double bank of outside elevators in the middle of each building. The ice and drink vending machines are near the elevators. The landscaping around the pool in this area is meant to resemble seaweed. In some spots it obstructs access causing a few rather long walk-arounds. 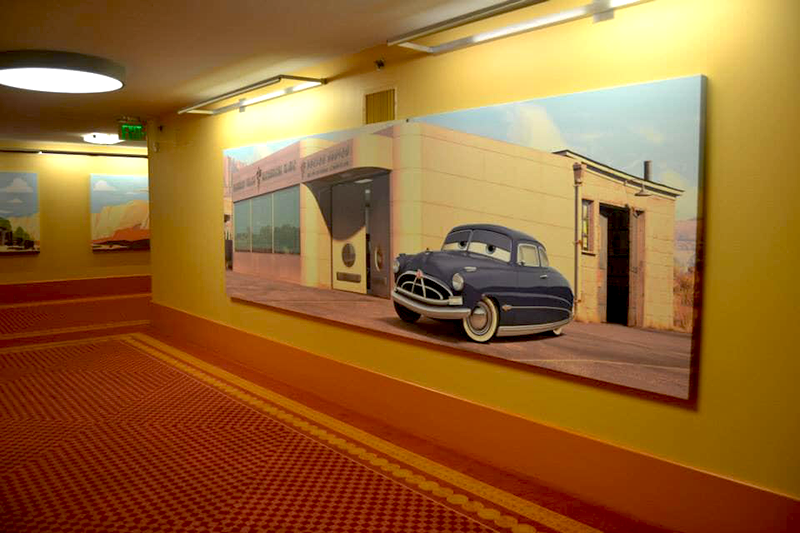 With approximately 277 square feet, the Art of Animation standard rooms are slightly bigger than the 260 square feet in the other value resort standard rooms. If you want an alarm clock, you can request one. They’re not automatically put in the room. 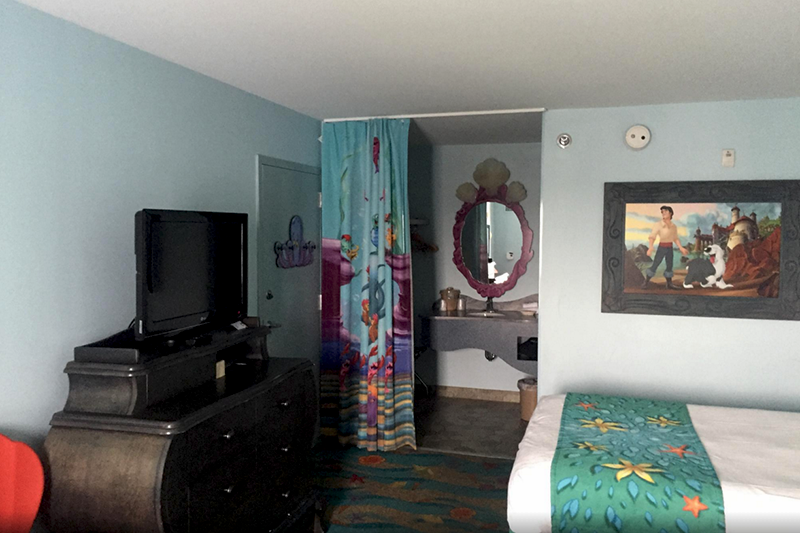 The rooms are cheerfully themed and brightly colored, featuring a generous amount of blue and teal with ocean waves and sea life depicted everywhere. The headboards resemble giant clamshells, with some bubble-like light effects and a bubble shaped reading light built in. The main area has a small table that has two chairs with clam shell shaped backs, a chest of draws, and an octopus themed coat hanger. The bathroom has a single exterior roll-under sink and counter vanity area that separates from the bedroom with a themed curtain. It in turn closes from the toilet and shower room with a door. Most bathrooms have a tub/shower combination. The surprisingly dark blue interior of the tub/shower combination is made of tile depicting an under the sea treasure scene. TIP: Do you definitely need a bathtub? There’s a chance you may not get one, so you’ll want to request it. 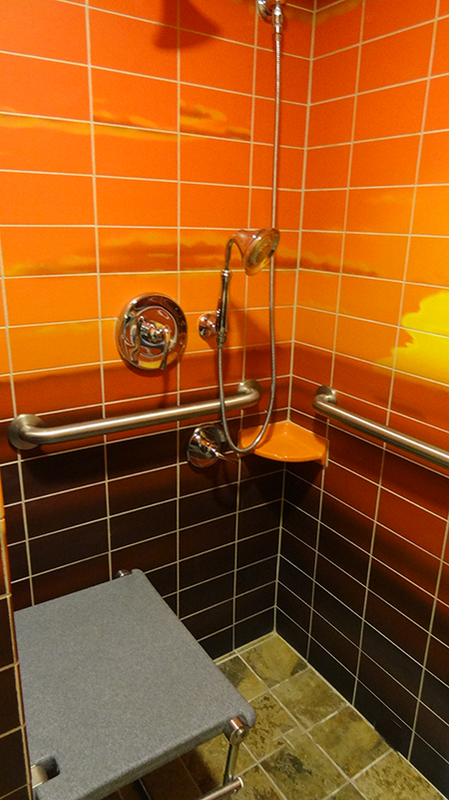 The wheelchair accessible handicapped rooms have a roll-on shower without a tub, and these rooms can be released to the general public if they’re not in use by someone who needs the handicapped features. Make sure to request a tub if you need it. Ice is available on each floor near the elevators, and the laundry is in a building by the pool. Unlike the suites, there is no coffee maker. One of the unique features of this resort is the “family suite” arrangement of all the rooms, except those in the Little Mermaid section. The 1,120 family suites sleep up to six adults and are found in the Cars, Finding Nemo and Lion King sections of the resort. One queen-sized bed in the Master Bedroom. Kitchenette supplies – Plastic and paper kitchenware including paper plates, bowls, cups, forks and knives, and a can opener. One queen bed is in a private master bedroom with a door. Another sofa bed is in the “living room”, and another is a table bed in the entry hall/dining room area. The table bed is a Murphy-style bed that folds away into a table that includes little reading lights. It is also weighted so most people should find that it’s easy to pull down and lift back up. There are chairs for use when it’s in its table form. The master bathroom is clearly designed for grown-ups with its non-themed sliding door to shower and subdued colors. The living room bath is for kids. It has bright décor, and a tub with a themed shower curtain. Parents may wish to take note that in the Nemo section the shower curtain features a large and potentially scary animated shark baring his fangs. The kid’s bath has a door separating the bath/toilet and sink area. Family suites have TV’s that are on the smallish side. One is in the living room and one is in the master bedroom. They have hookups for your own DVR. There are electronic safes in every room. WiFi is free. We were told that because of the newer, thick hurricane-resistant walls, cell phone service inside most rooms is poor to nonexistent. Disney is working to address that now, and by the time you arrive it may no longer be a problem. Ice is available on all floors, in the center of each building. 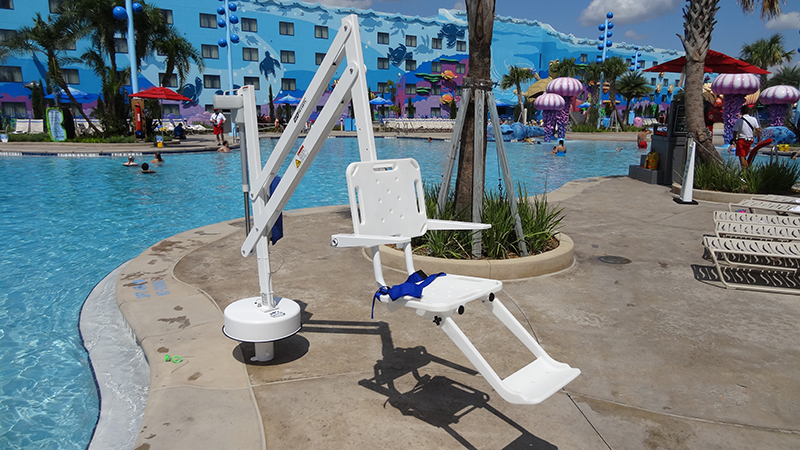 To view the types of rooms, accessories and options that Disney offers at all its resorts, check out this article called Reserving Handicapped – Accessible Rooms in the Disney World Resorts. Available upon request: When you make your reservation, let them know what you need. Some things available include: hearing-impaired TDD telephones, bed shaker accessory, visual smoke alarms, wake up alarms and door knocks; bed boards and bed rails; Sharp containers for used syringes; connecting rooms (not guaranteed) unless you have children staying alone in the separate room (be sure to confirm this when you make your reservation). Guests can also request cribs, and a Pack ‘n Play at no extra charge. 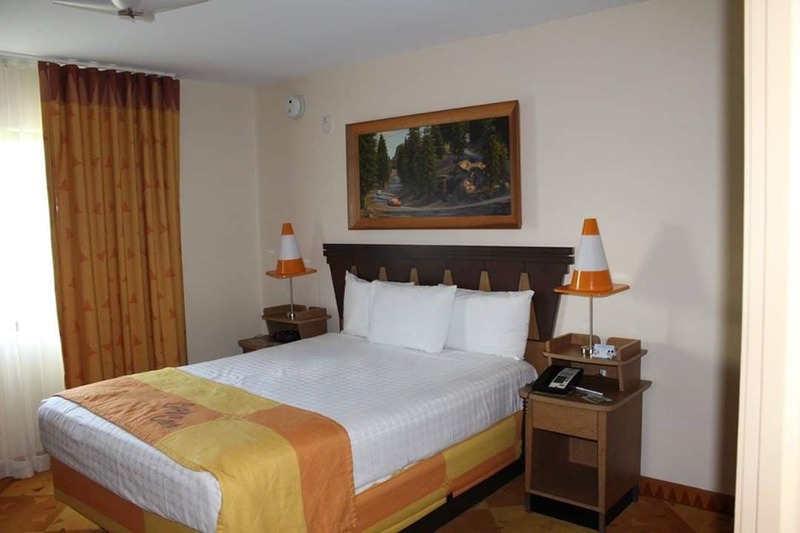 Handicapped Standard Rooms: The ADA accessible rooms have 2 double beds. Keep in mind that the rooms are quite small. Regardless, we hear from our readers that they’re able to manage. Handicapped Suites: Handicapped-accessible have 1 queen bed, 1 double-sized sleeper sofa and 1 double-sized table bed. The suites are set up differently, as they’re arranged for more maneuvering space. For most suites, the living room bathroom has a walk-in shower, toilet bars, and roll-under sink, and it doesn’t have the closing door between the shower and sink. In some suites, both bathrooms are accessible. When you arrive at the resort, you can approach the Luggage Assistance area and request your chair. They should bring it right to you. You’ll have it for check-in so you won’t have to stand as you wait in the line. You’ll leave your chair with a cast member in the luggage area when you depart. 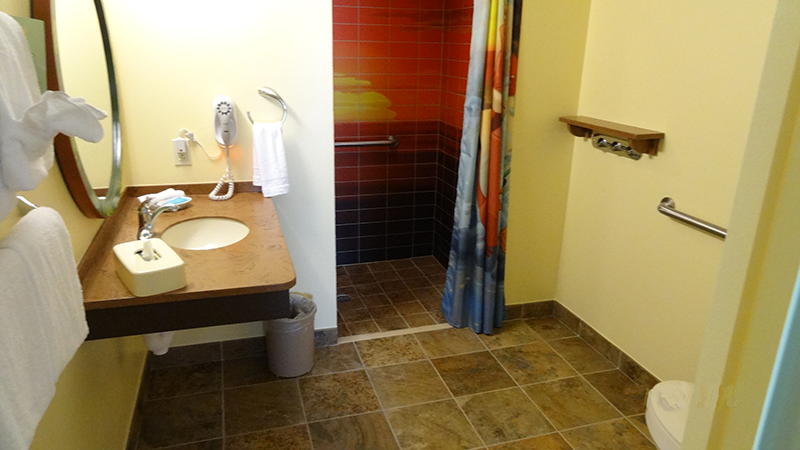 As with all of Disney, accessible rooms are not usually any larger than standard rooms. This is not a problem with the Family Suites, but for the standard rooms wheelchair and ECV users may find these resorts challenging. While you should be able to ride your wheelchair inside your room to store it, it will be very tight and may require some maneuvering. You can choose to leave your chair outside of your room, but it may be exposed to sideways rain. If you need to stay in your chair while you’re in your room, you may want to consider a resort with larger rooms such as the Polynesian, or a larger suite in one of the deluxe resorts. Even a room in one of the Moderate resorts would be easier, though tight. Nemo is closest to the main building with its restaurant, shops, and the large main pool. It’s a reasonably long walk from one side of the resort to the other. There are no internal buses, so if mobility is an issue, consider a suite in the Nemo section. If you’re looking for a location that may be less noisy (remember, there’s no guarantees anywhere in a hotel, and especially not in a value resort), request a room in the Nemo section facing away from the pool, or in any of the other three sections. Pool hours change depending on the season, but if you face the pool, you’re likely to be listening to all the tumult when it opens in the morning until until late in the evening. Lion King has no pool, a minor playground and would probably be the quietest location. 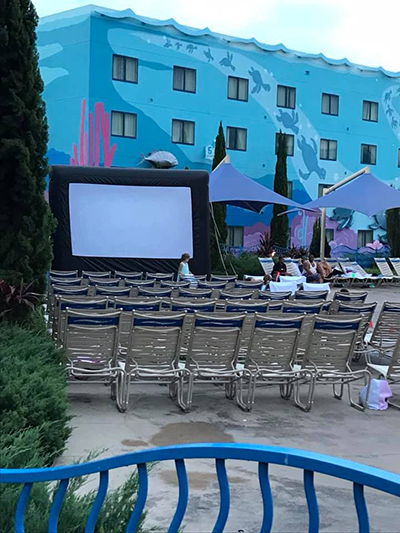 In the past they’ve shown the free outdoor movies each evening in that area, but we hear they’re currently being shown in the Nemo area. This could change back though, with the potential of bringing some noise. Cars has a small quiet pool, which some will find preferable. If you’re staying there and want to be closer to the main building, ask for building 1 or 3. Building 2 is farthest from the action. 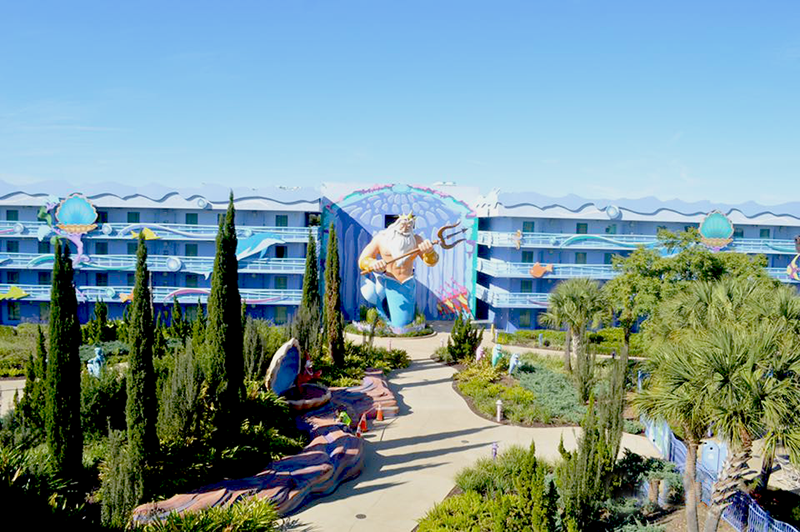 Little Mermaid is the farthest section of the resort; if you want to stay there and be as close as possible to the center of the resort (with the Nemo pool and store and restaurant), ask to be in building seven. The pool-facing rooms in building seven can be noisy, so for a chance at more a quieter room, request to face the lake. Landscape of Flavors Food Court: This is the only restaurant in this resort. Serving breakfast, lunch and dinner, there’s a wide variety of choices. There’s an interesting mix of options here. Some would be considered mainstream, some are on the exotic side and some are considered healthier eating. Surprisingly, this food court actually has tandoor ovens where they cook naan bread, and a variety of other dishes. Some of the breakfast choices include create your own omelet’s, challah French Toast, vegetarian or non-vegetarian breakfast sandwiches, egg white omelets, various types of pancakes and waffles, and a full breakfast platter, smoothies and green spinach drinks. Lunch and dinner includes a wide variety of options. Some of the more exotic choices include Mongolian grilled fish, Asian chicken bowls and Tandoori boneless chicken thighs. Some of the more mainstream choices choices include pizza, pasta, create-your-own salads, sandwiches, soup, burgers and chicken nuggets. Room Service: This consists of pizza, salad, wings and sandwiches. Delivery to guestrooms goes from 4 pm through midnight. 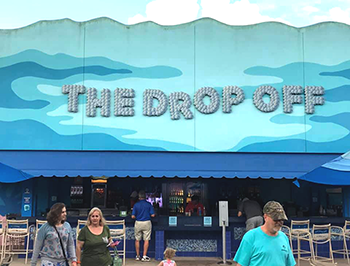 The Drop Off Pool Bar: This is located by the Big Blue Pool. It has alcoholic and non-alcoholic drinks and a small number of snack foods. There are hard metal bar-stool chairs or soft slatted chairs around umbrella tables scattered nearby. Ink and Paint Shop: Along with the standard Disney resort store items, the Ink and Paint Shop actually sells some art supplies, and there are some cool faux-paintbrush pens at this writing. We were impressed by the relative scarcity of sparkling, child-grabbing, tantrum-causing displays on the route to the food court. Much of the store seems on the surface to be geared toward adults. 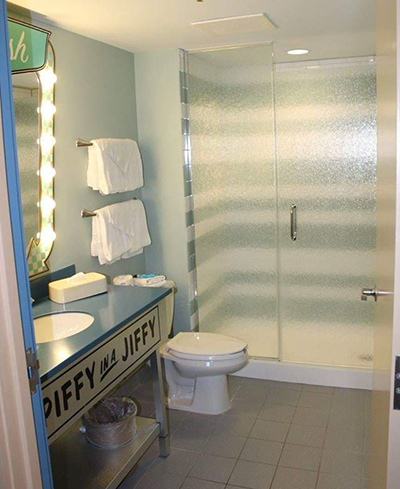 They even carry the same shower curtains that you’ll find in the resort rooms, and they’re working on a retail version of the themed room lamps as well. Of course, there are plenty of toys and candy, but most are tucked nicely into shelves so that you have to look for them. Despite the kitchenettes in the room, there’s not much “real” food here. This resort has three delightful pools – One large pool and two smaller pools. The large main pool also has a pool bar, and wet and dry play areas (see below). All the pools are gated. Only guests of this resort are allowed inside. Water Temperature: Though the water is supposed to be heated to 82 degrees, but even if it is, it can still feel pretty chilly, depending on the outside air temperature and your level of sensitivity. We find that we’re unable to swim in the winter, but there are almost always more hardy souls in the water. We have noticed that at times Disney does not heat the pools at all, but when we’ve alerted a Cast Member and requested heating, they’ve usually complied. Also, the larger main pools can be more difficult to heat in the cool weather, and they’re rarely at the advertised temperature of 82º Fahrenheit, while the smaller pools tend to heat better. Towel Service: On last check towel service is available at the main Big Blue Pool, as well as at the two smaller pools. Lifeguards: According to Disney, the main pool called The Big Blue Pool will always lifeguards during it’s regular hours. The two smaller pools will vary, at Disney’s discretion, but the feedback we receive is that these two pools are guarded. However Disney says that sometimes they will have lifeguards and sometimes they won’t. You’ll want to double check once you’re onsite. The Big Blue Pool (Main Pool): This incredibly fanciful pool is located directly behind Animation Hall and in the Nemo courtyard. As the largest Disney World pool outside of the water parks, it holds 310,000 gallons. Sound is piped in underwater so that while you swim you can hear the voices of your Nemo friends. There’s a stereo effect with the sound moving so that the creatures seem to swim past you. The Big Blue Pool is fairly shallow being 4’8″ at its deepest. There’s a zero-entry area by the play fountains, and two handicap-access lifts. These are chairs that lower you into the water. Water-wheelchairs are available. Ask any lifeguard. This pool uses a salt-type filtration system in place of chlorine or other chemicals, and it tends to be less harsh than those. It does not turn the water salty, though. The chairs are the typical soft-slatted pool types with some chaise-lounges and some upright chairs around umbrella tables. There’s a box of life-jackets available to guests. Play areas by the Big Blue Pool: Though there are no water slides, the School Yard is a Nemo-themed wet play area by the main pool. 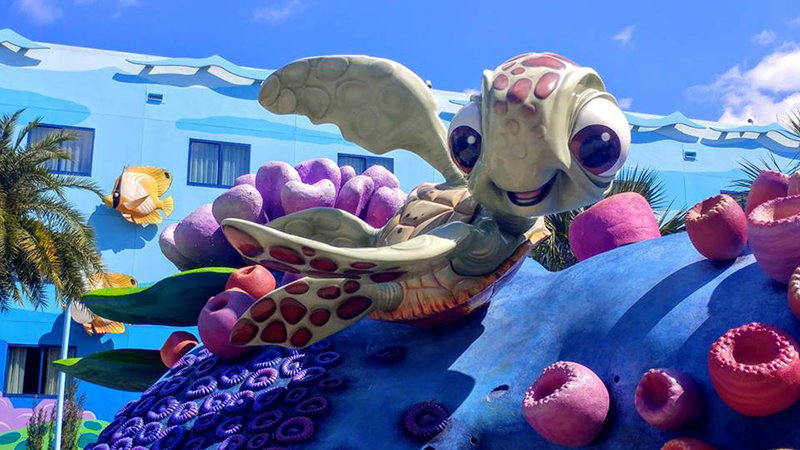 It’s fancifully designed with Nemo-themed water jets and fountains, and is on a special soft surface made from recycled sneakers. 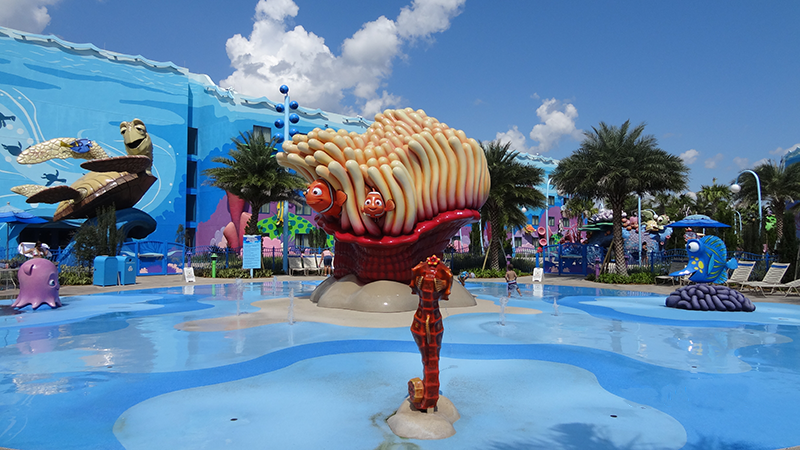 Also close to the pool, Squirt’s Righteous Reef is a non-water playground structure with slides and tunnels themed to look like a brightly colored, large chunk of coral. A cast member told us that Disney is working hard to come up with a slide material that doesn’t turn to a fry-temperature griddle in the sun, but so far we find that they haven’t been successful. Instruct your children to stay on the shady side of the structure on sunny, warm days. Behind the Drop-Off pool bar is a laundry, restrooms and changing area. There are lockers, bathrooms, showers and changing rooms. The building is tiled, and there’s plenty of room to maneuver wheelchairs or ECVs. There’s a handicapped accessible changing booth/shower. Cozy Cone Pool: The comma-shaped Cozy Cone Pool in the Cars courtyard is very small and shallow, 4 feet at its deepest point. There are no special water features. There’s no zero entry, but there is a handicap-access lift. It tends to be quiet. There are plenty of slatted beach chairs and a few umbrellas. Dotted around the pool are enormous themed traffic cones that serve as shady tents available on a first-come first-served basis. This pool usually has the same hours as the large Nemo pool. Right by the pool, the “Cozy Cone Motel” houses the smaller changing room, with bathrooms, showers and laundry. There’s a handicapped accessible shower here. Flippin Fins Pool: The Flippin Fins Pool is in the Little Mermaid section. It’s quieter than Nemo, but it’s quite a bit larger than the pool in Cars, and thus busier. There’s no associated playground or water features, but there are whimsical statues in the courtyard, including huge (possibly scary to the sensitive) reproductions of your favorite characters from the movie. It’s the farthest section from the main pool and the main building with the restaurant. The Flippin Fins Pool is 4 feet deep at its deepest point, and The pool has a handicap-access lift. Near the pool is a nice scattering of slatted lounge chairs, regular chairs and umbrella tables. There’s no other shade around this pool. 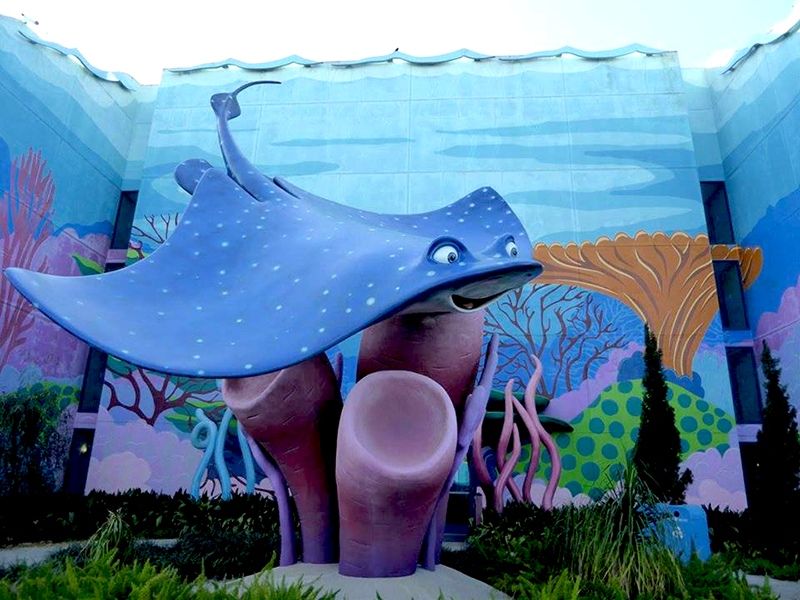 Dedicated Buses at Art of Animation – A great perk! Like the other value resorts, the main form of transportation available here is the bus system. You can take a bus to theme parks and Disney Springs. The buses do not share with any of the other resorts, so the rides are quicker than they might be otherwise. This can be a HUGE perk for anyone trying to choose between value resorts. There’s only one bus stop to the left of Animation Hall as you face it. Unlike most other resorts, it’s completely under cover. There’s a metal bench, but it’s not long enough to seat everyone during busy times. Starting in the fall of 2019, Disney will have a new gondola system at 4 resorts and two parks. Disney’s Pop Century and Disney’s Art of Animation resort will share a gondola station. The gondolas will ride over Hourglass Lake making for a pleasant view! They’ll will connect the resorts with Hollywood Studios and Epcot’s International Gateway entrance. The other resorts that will have gondolas are Caribbean Beach and Disney Riviera. Activities may be subject to change, but there’s usually a lot of family friendly staffed activities. It starts at the easels right outside check-in where an “animator” will help your child draw the character of the day. 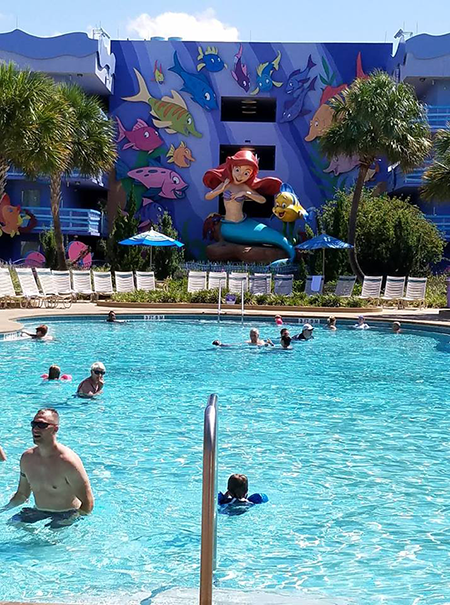 In the afternoons and evenings the Nemo courtyard comes alive with cast member led activities such as bingo, arts and crafts, hula-hoop fun and water basketball. Every afternoon at 3:00 PM there’s a Big Blue Pool Party followed by dancing. Every night in the Lion King courtyard there’s a Disney movie scheduled showing on a large outdoor inflatable screen. The Pixel Play Arcade is right off the main lobby. It’s large and carpeted, and it’s a mix of classic and new games. 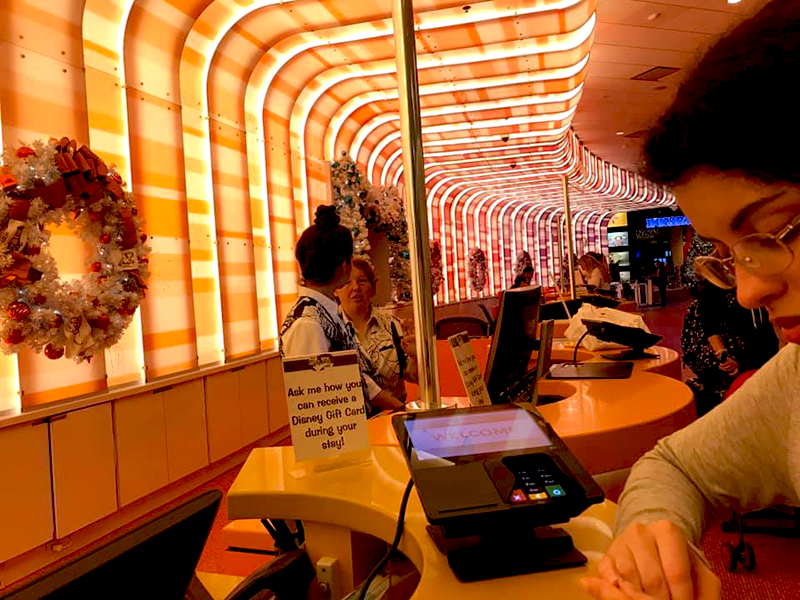 You fill a card with money at the front desk and your kids (or you) use it up. 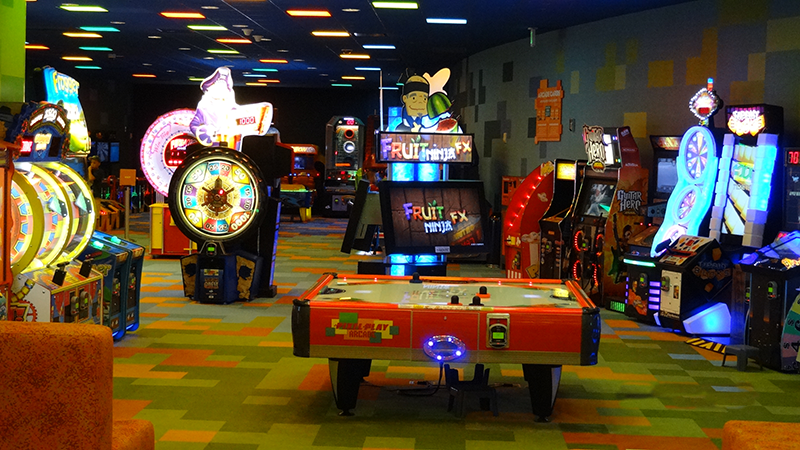 The unique thing about this arcade is the (relatively) quiet, generous seating area in the front for parents, with plugs and WiFi. There’s a small sort-of playground (if you call a cave a playground) in the Lion King section. This elephant boneyard-themed (thus potentially scary to the sensitive) playground-cave is built on a long-lasting soft surface made from recycled sneakers. Disney hopes this is an improvement over old-fashioned recycled tires. There are life-sized characters, a cave to enter and an enormous fallen tree to cross under. There are no slides or swings, and there are signs warning children not to climb on the enticing structures. The lake is not swimmable, and there are no boat rentals, but there’s a path that leads all around the lake for walking or running. At the far end of the check-in counter is the business center that has standing- and sitting-height computers, pay telephones, and a cash machine. On the wall there’s a frequently updated board listing flight times for Orlando Airport, and there’s an airport check-in. There are coin-operated Laundromats at each of the pools. They’re inside the buildings that house the pool changing rooms. Washing machines are front-loading. Dryers are stacked. Compared to moderate or deluxe Disney resorts, value resort guests receive a much lower level of service and assistance at the value resorts. For example, although you can leave your luggage with Luggage Assistance at the front entrance (notice it’s not called bell service because it’s not considered the same type of service), it can take around an hour or more after check-in for your luggage to be delivered to your room. We suggest that you think ahead and pack anything you may need in a carry bag that you keep with you. Some people like to pack swim gear in a carry bag so they can go swimming after they arrive. If you feel that you’ll need your luggage quickly, you have the option to bring it to your room yourself. You should be able to use one of the resort’s luggage carts, but they require that you have a credit card on file to do so. At check out, luggage services in the value resorts are not as convenient as in the other resorts. Instead of calling when you’re ready to go, they require 24 hour’s notice. What may be even more challenging for guests with health issues is that they don’t guarantee availability of luggage service if you call the day you’re leaving. They request that you call the night before you’re leaving to make arrangements if you wish to be certain that you’ll have your luggage handled for you. If you’re not leaving right away, they can store your luggage for you until you’re ready for it. After you check in, you’ll need to either drive your own car or walk to your room. There is no internal transportation service. Several of the moderate resorts will ride you in a golf-type cart along with your luggage, and the Caribbean Resort has its own internal bus system. The value resorts don’t offer this. Smoking is banned in all Disney-owned hotel rooms. Even patios and balconies are non-smoking areas. Of course it’s always possible that another guest could smoke in a room anyway, but Disney reserves the right to charge a penalty since they’ll need to specially clean the room. This usually discourages people from smoking inside their rooms. There are pre-designated outdoor areas around the resort where smoking is permitted. 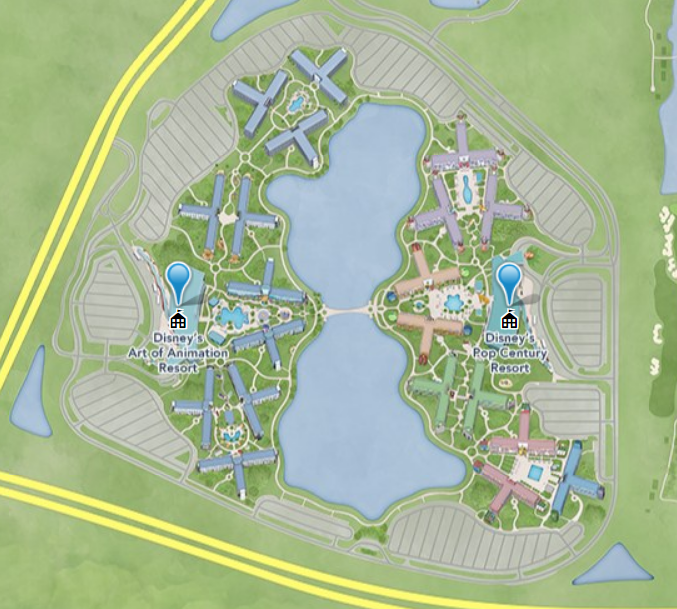 The resort map that you’re given when you check in should have the areas marked, or ask a cast member when you check in. Thank you to all the people who donated photos! Whether we used them or not, you all rock!